Back when I was first getting into hiking, I figured it couldn’t hurt to pay a little extra for Gore-Tex or eVent in my footwear. These so-called waterproof-breathable fabrics worked well enough under mild duty — quick strolls across dewy fields in the morning — that the most-of-the-time comfort felt like a good trade-off for those demanding times (drenching rains, for example) when they really didn’t keep my feet all that dry. Last summer I bought a pair of Vasque boots that rubbed me the wrong way — painful as hell no matter how long I tried to break them in. I liked everything else about them, but they rubbed a nerve across my ankle bone, so I had to trade ’em in (props to REI for curing shoe-buyer’s remorse). I settled on a pair of Merrell boots that had what I needed: stiff, lugged soles for nasty North Carolina trails and ample padding around my abused ankles. If you’ve ever shopped for Merrells, you might’ve noticed they have Gore-Tex-lined models, and yet another category tagged “WP,” meaning waterproof (is Merrell saying its Gore-Tex models aren’t waterproof; hmm, I just figured it was because consumers demanded Gore-Tex). Anyway, my WP-tagged Merrells have performed as promised: They’re the most water-tight boots I have ever owned. I can walk across open fields of wet grass without feeling any cold water seeping in; I can stand in creeks with no leaks. The only time any water has gotten in was when I misjudged a section of stream and stepped in over the edges of the boots. I tried them out again this morning in a pond at the park across the road. No leaks, no seeps. But it was also 80º F in the shade with 95% humidity, so when I got home my socks were drenched anyway, from sweat. Which just goes to show that gear which performs flawlessly in some conditions might not be worth a damn in others. Good boots aren’t cheap, and we’d love to be able to get by with one pair. But there’s rarely any single boot that gets the job done 365 days a year. Here in the Southeast we get absurdly steamy summers. My Merrell WP’s are bone dry in the winter, but a tad too soggy in the summer. I wear them anyway because I’m too frugal to spring for a new pair. So why did I even buy waterproof boots? I suspected they’d be sweltering come July and August, but they were the only models in stock that fit. I can always tell when a boot’s going to rub me all the way to blister city. If I’m lucky to find a rub-free pair, I usually buy them. Even if they’re waterproof. I just don’t harbor any illusions that water-tightness had anything to do with why I bought them. I do quite a bit of hiking with wet crossings. My Vasques (gore-tex and waterproof) are great. I’ve heard plenty of people say that non-waterproof boots breathe better and dry faster when they do get wet, but I haven’t had much of a problem and I can’t imagine wet boots drying fast enough on my feet. Tolerance for wetness is a major issue — I can hike all day on wet feet but others get horrible blisters. I’ve deliberately dunked Gore-Tex lined shoes and noticed that the same qualities that keep water out also seem to keep it in. 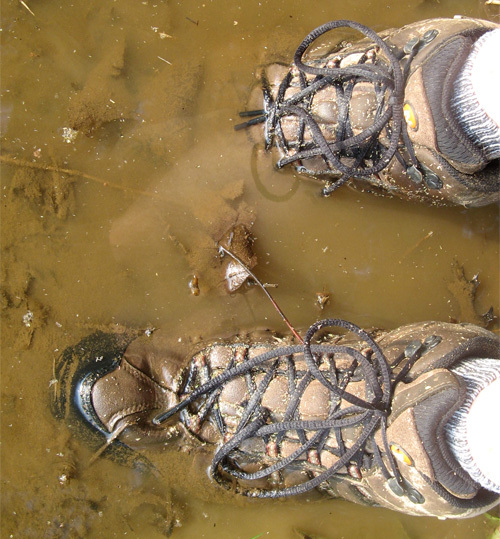 It’s definitely easier to “hike dry” a pair of shoes or boots that aren’t trapping water on the inside. Interesting take. Finding a boot that doesn’t give you a blister can always be a challenge. I’d choose sweaty feet over blistering any day! Sometimes sweaty is the first step to blisters, which are caused by friction, which causes heat that makes feet sweat. Hence the profusion of mesh in so many shoes these days. I agree that Gore-Tex is not the best for every situation. I also own a pair of mid-height Merrelll’s, the Moab Mid Gore-Tex and I love them for winter hiking and very wet conditions. Over 3 years I have never had a leak problem, and they have kept water out of my boots from stream crossings and snow. However since I took them hiking last year in the Cascades and did day hikes only, I noticed they were too hot and heavy for my weekend hikes. My hiking partner used trail runners and recommended I get some for hotter weather. I bought La Sportiva Exum Pro, which is an approach shoe and more heavy duty than a trail runner with better cushioning and stiffer heel. But these were mesh, breathed amazingly well and dry quickly. I only wear these now when I hike, would highly recommend looking at a heavy duty trail runner style shoe, or approach/bouldering shoe as La Sportiva describes. I could not imagine hiking in this weather with my Gore-Tex boots. So ive gone with a cheap ish pair, that is sturdy, supports my (weak) ankle and slightly breathable. Well that was my last pair, amazing and lasted years. MY new pair seems a bit heavy. Anyway I’d rather accept my feet will get wet in excessive rain and puddles what ever pair I will buy, so save my money and get a pair that drys quickly. Yeah, it’s kind of a science to decide which outdoor footwear is going to serve any particular adventure best. There’s definitely no golden ticket answer to every hike. One thing I’ve found is that caring properly for my waterproof boots and shoes helps them stay more waterproof for longer, though; especially since waterproof footwear seems to be a bit on the pricey side for quality boots or shoes, I tend to be overcautious. But I found this article: Caring for Your GORE-TEX Products and it’s actually helped me make my waterproof boots last longer so that even if they’re not perfect for every terrain, at least they’re still perfect for what they’re meant for. 🙂 Happy hiking! I had the Merrell Outbound Mid Gore-Tex boots and while I liked them, they are not waterproof. Someone posted a review of them stating that he has stood in streams up to his ankles for 20 minutes at a time without getting wet. I filled up 2 buckets (not even ankle depth) and sat on my deck for 20 minutes. Result? Right foot dry, left foot soaked. I work outside and do a lot of hiking in wet areas. Rubber seems to be the only answer. Yeah, I quite agree on this. Like this shoe, waterproof products and other extraordinaire items can be sometimes a result o marketing hype. I gave up my clunky Keens for low top Scarpa Zens. Figured if Scarpa made the best backpacking boot, they would make a great hiking shoe. I love them!